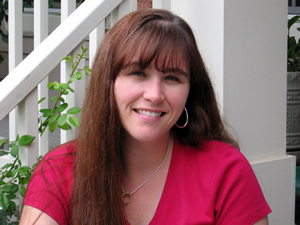 This is a post from 2008... so yes, since I'm not posting right now- I am recycling! I thought it might be of current interest. 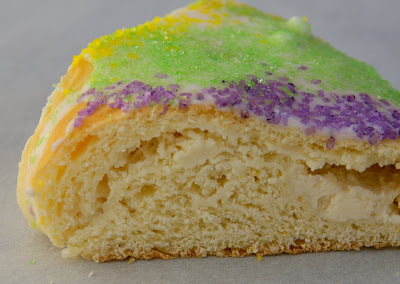 Stemming back to the 1700's, King Cakes are the traditional celebratory cake of Mardi Gras. Originally king cakes were served at Mardi Gras Parties and the king cake held a bean inside instead of a plastic baby. When served, the "lucky" person having the bean on their plate was named the king or queen of the party, and was then responsible for holding the next Mardi gras party which would include all the guests present at the party where the bean was found. Living in South Louisiana, I have eaten more than my fair share of King cake. The bakeries make them in just about every flavor imaginable. The most popular are Praline and cream cheese, which is my favorite. Up until today I had not made my own king cake, but a few days ago I stumbled across this Swedish Ring at Tartelette and knew it would be perfect for my cake. I used the dough portion of her recipe and adapted it to make my king cake, then filled it with cream cheese. I am not an avid yeast user, so making bread which uses yeast as it's leavening always makes me a little nervous. I followed her directions exactly, but the first batch of dough turned out a bit dry. I made a second batch with less flour and it was perfect. We emailed back and forth and she confirmed it was the flour, she had forgotten to write to add the flour in stages. Since the first I made this I have learned to add flour slowly- you can always add more, but can never take it away. 5. Lay dough on lightly floured surface, punch down and roll into a 20" by 10" rectangle. Spread cream cheese mixture evenly on one half of the dough, then fold other half over to cover. Pinch dough together to seal in cream cheese. Make a ring and pinch ends together, the ring can be a circle or oval. Place on a parchment lined cookie sheet, cover loosely with plastic wrap and allow to rose for 45 minutes. So, did you hide a baby or a bean in your king cake? It looks so beautiful with the traditional icing colors. 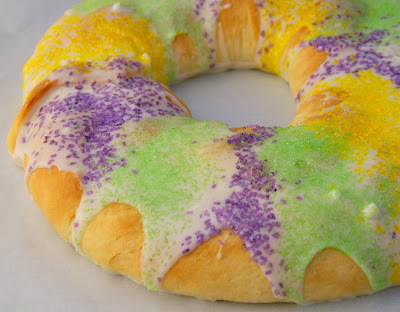 Hey it's King Cake time again! You should not worry about yeast dough so much. In any yeast recipe, especially one never tried, I always hold back a hefty cup of flour. Never dump in the entire amount listed. Depending on conditions like humidity, your liquids and fats will "want" to absorb an optimum amount of flour, and this can vary even from day to day. Exceed that flour amount that the liquid wants, and your dough will be dry. By holding back a cup of flour, I can add what I want to get the dough to an optimum state, as well as having a little extra freed up to use as bench or pin flour without having to reach into the bin and scoop. I would pick out a simple white bread recipe and make it a few times in succession. One that uses some milk and butter is better for learning, because the dough will be a little stickier than say a pizza dough and you can get a better handle on learning to "feel" the dough. With a little practice and judging your results, you'll gain more confidence. I have some old time bread recipes where it just says "add flour" but because I do so many breads, I can usually judge when my dough is just right. I'm from Louisiana & I've never had King Cake!! This will be the year! Question: Could this be made the day before serving? This is a marvelous blog! I've been so blessed just by reading your recipes! I have MANY old southern cookbooks and am partial to southern fare! Thank you! If you have some experience with yeast doughs, I would try a tiny bit higher hydration, just a tiny little more liquid or hold back a little bit of flour. This will give you a little more moisture content in the dough. If not, just follow the recipe, don't slice the cake. If the temperature is very warm in your area and you use a cheese in the filling, refrigerate and take it out an hour of two before serving to guard against overnight spoilage. Really, making the day before should not be a problem. You could make the day before and put the icing and sugar on the day of serving. This looks delicious! Thanks for the idea...and the Sugar Rush! I followed a trail from this sweet collection on Sugar Rush to your blog, and can't wait to enjoy your King Cake! Oh, and congrats on being included in the Sweet Sixteen collection! Absolutely wonderful - I like to make my king cake near Ephiphany (in the French tradition) but prefer the N. American style cakes. This was delicious!!! I made this tonight for a slightly early Ephiphany treat - delicious. Many thanks!